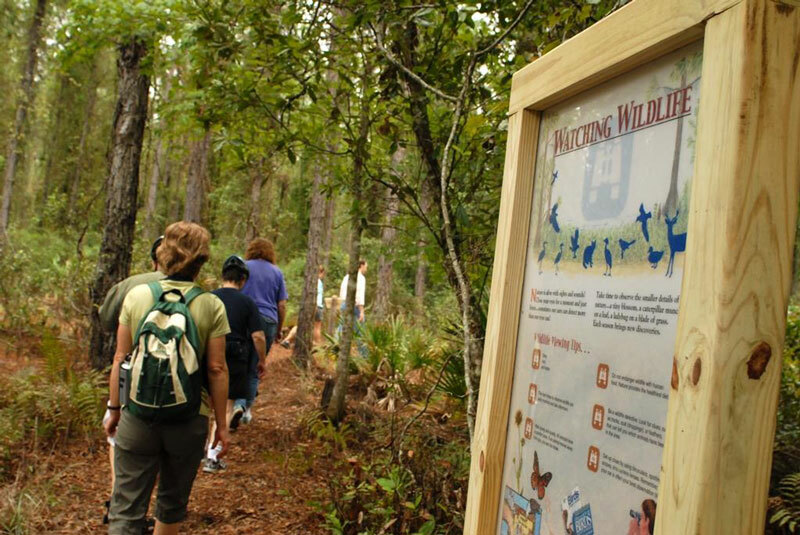 634-acre Preserve with 3.5 miles of unpaved trails through pine flatwoods and cypress swamp. Trails accessible from the paved Gainesville-Hawthorne Rail-Trail. Parking Lot at Intersection of County Road 2082 and County Road 325 on the GHRT. Marsh Trail Trailhead: access by taking GHRT 0.6 miles east from Main Parking Lot. Swamp Trail Trailhead. Access by taking GHRT 1.25 miles east from Main Parking Lot. Turpentine Loop Trailhead. Accessible from CR 2082, head 9/10 mile west on CR 2082. Trails may be wet and seasonally flooded. No picnic facilities. No restrooms. Trail maps are available at the Preserve or you can request a brochure by emailing the link on our contact page. Brochures are available in alternate format on request.